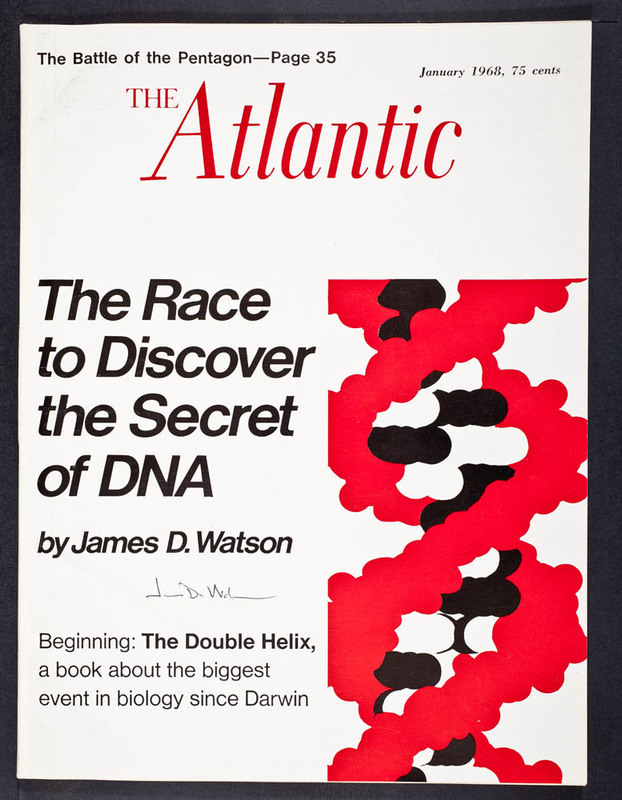 In 1968 Dr. James D. Watson published his first-hand account of the discovery of the structure of DNA. It invoked an immediate reaction from both the public and the scientific community. The highly personal account documented not the just science, but also the personalities that worked together (or didn't) to elucidate the double helix structure. 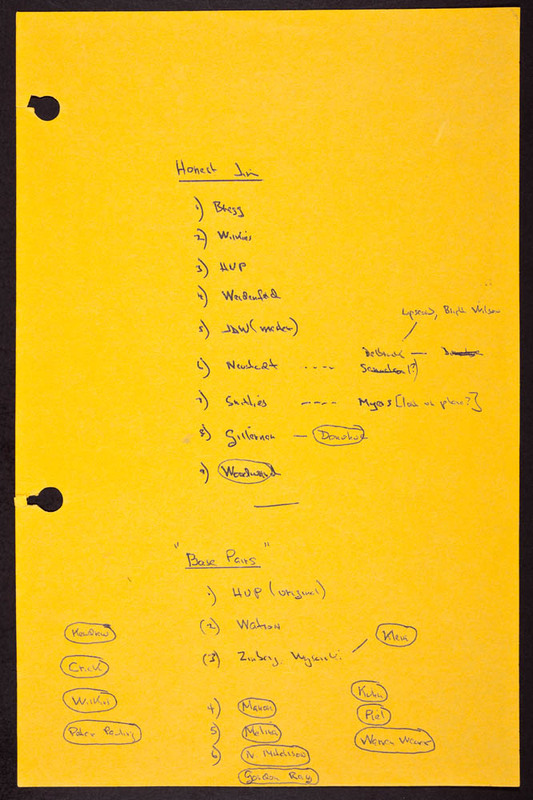 Although Watson began working on his story as early as 1958, it was not until 1966 that he circulated drafts of what would become The Double Helix. 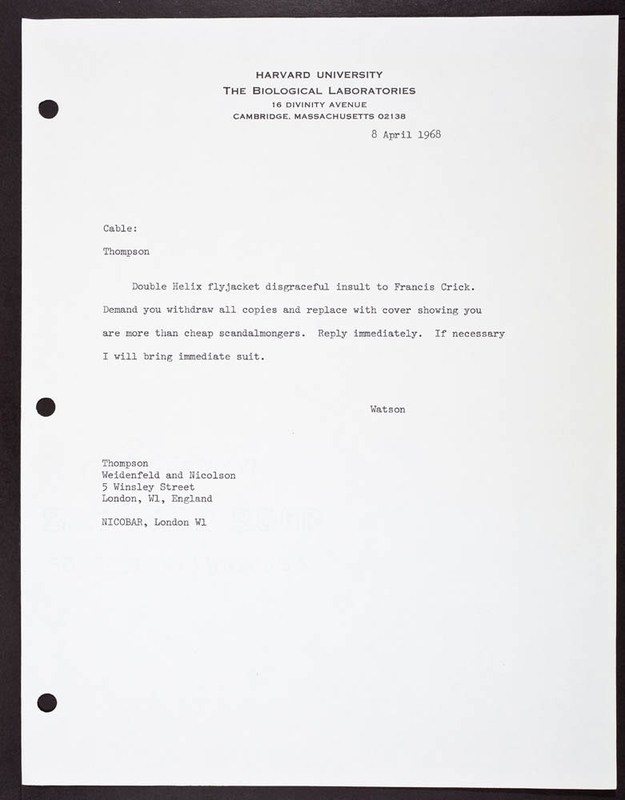 The immediate response of those depicted in the story, especially Francis Crick and Maurice Wilkins (Watson's co-recipients of the Nobel Prize for the discovery), was extremely negative. 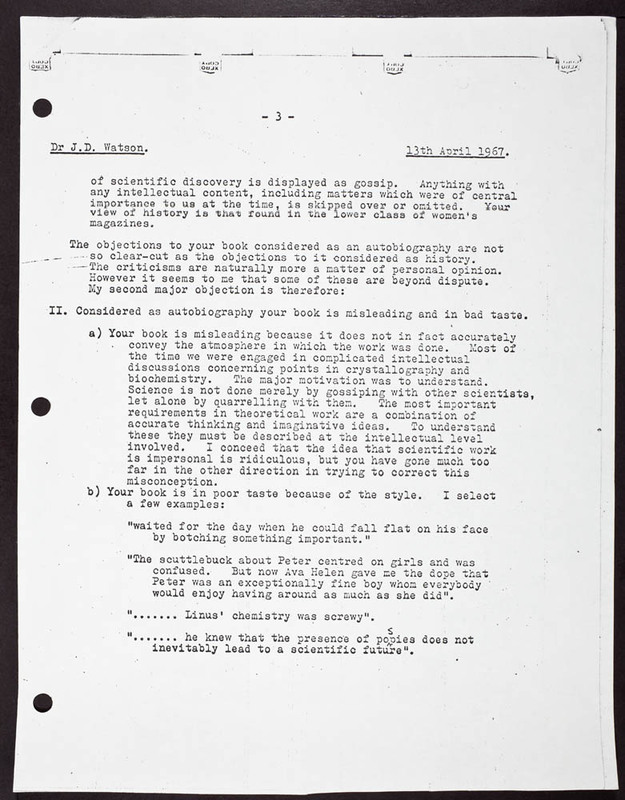 They disapproved of Watson's characterizations of themselves and of their collaborator, Rosalind Franklin. Despite revisions, neither were satisfied and soon threatened to prevent publication via lawsuits. For a moment it seemed like the story of one of the most significant scientific discoveries of all time would never see the light of day. 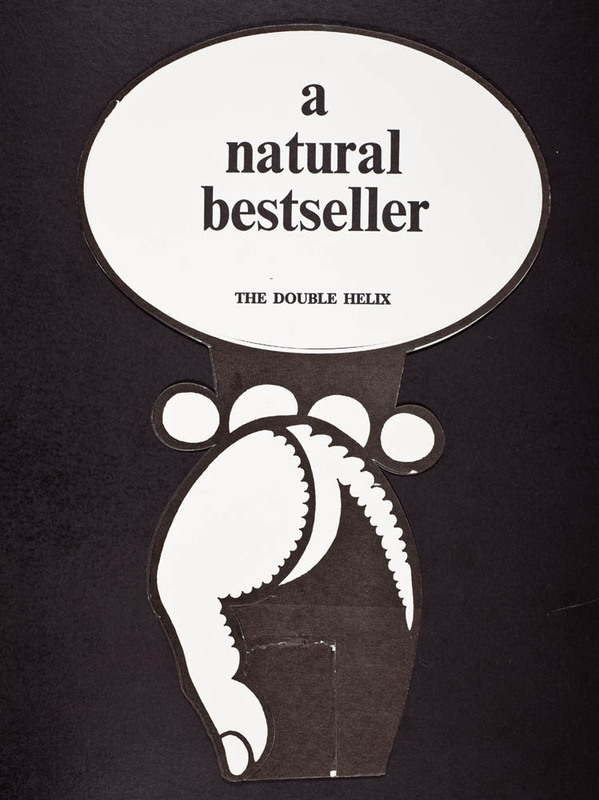 Publicity material for The Double Helix. 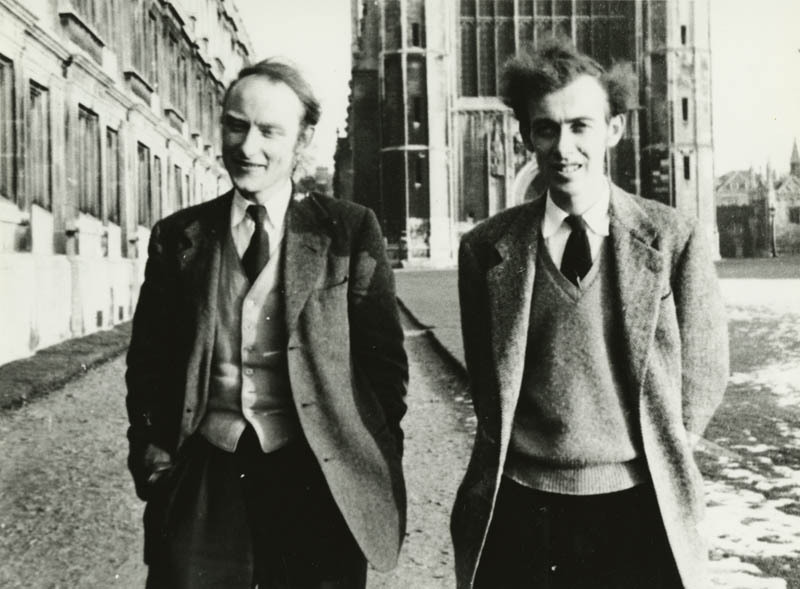 Francis Crick and James Watson in Cambridge, around the time of the discovery. 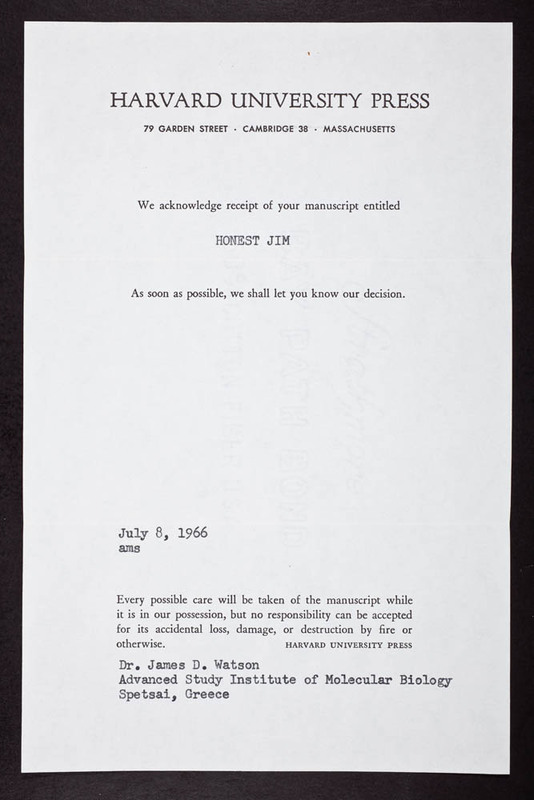 This note from Harvard University Press acknowledges the receipt of the Honest Jim manuscript. 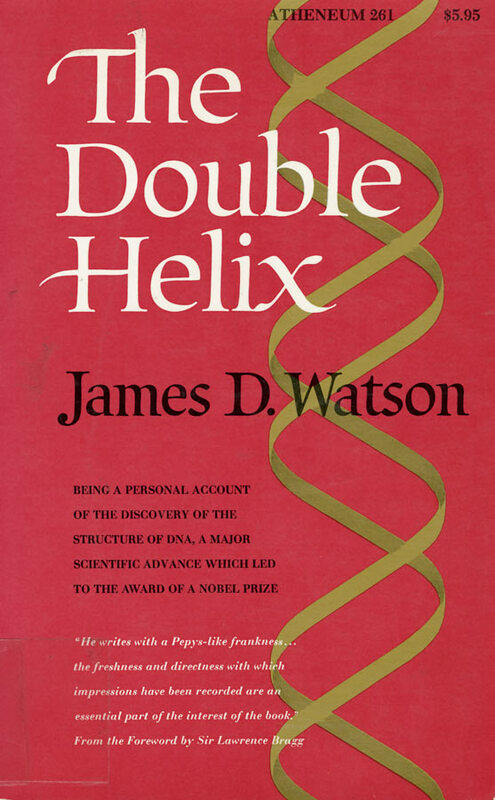 The title would later to change to Base Pairs before Watson finally settled on The Double Helix. 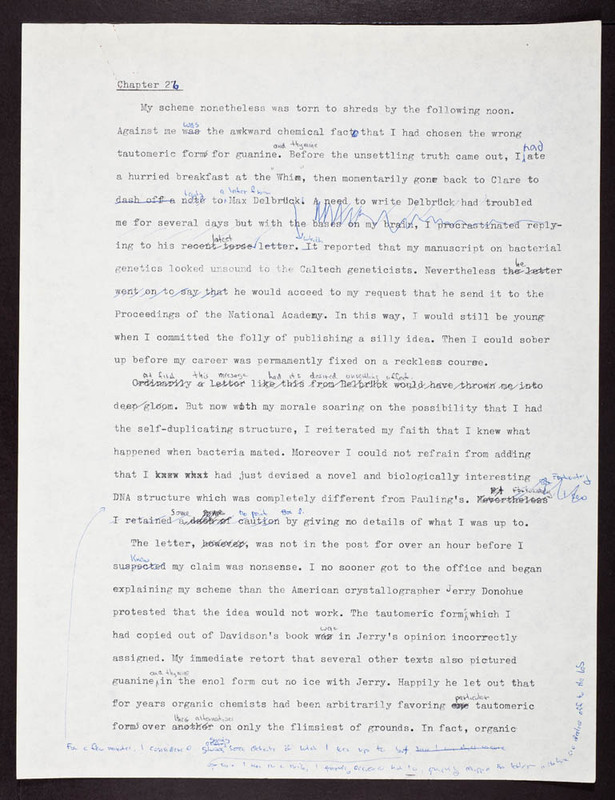 Typescript with annotations by Watson, November 1967. 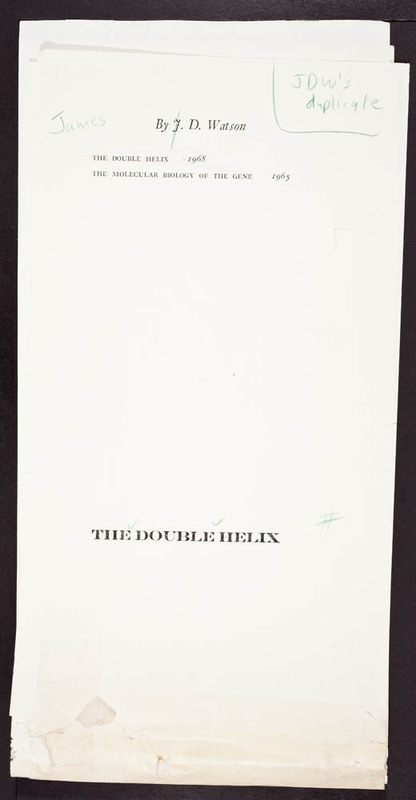 Galley proof of the title page of The Double Helix, 1968. 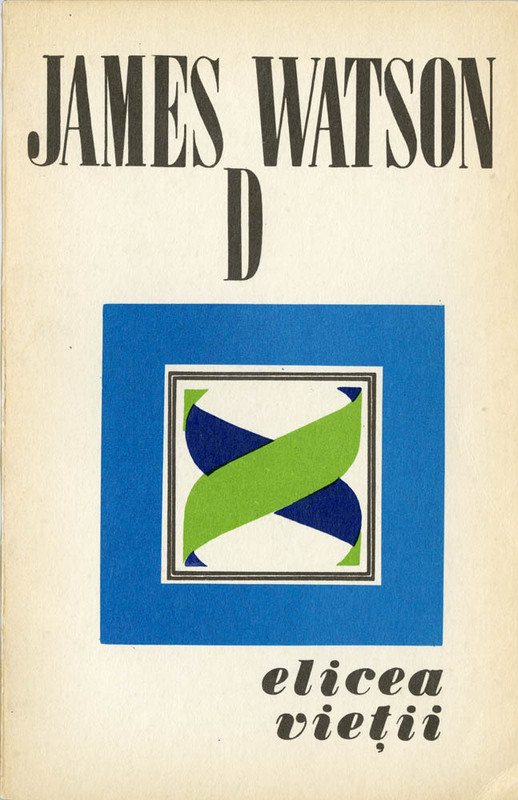 Watson sent out early copies of the "Honest Jim" and "Base Pairs" manuscripts to individuals who were featured in the story to review. Crick, Wilkins, and Bragg would soon voice their disapproval. 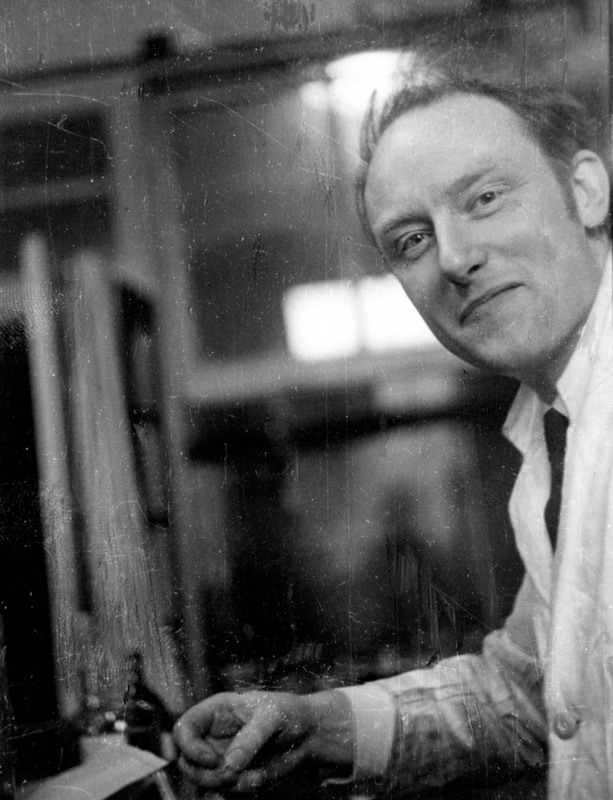 Francis H.C. Crick was born on June 8th, 1916, at Northampton, England. He studied physics at University College, London, obtaining a B.Sc. in 1937. During the war he worked as a scientist for the British Admiralty, mainly in connection with magnetic and acoustic mines. He left the Admiralty in 1947 to study biology. 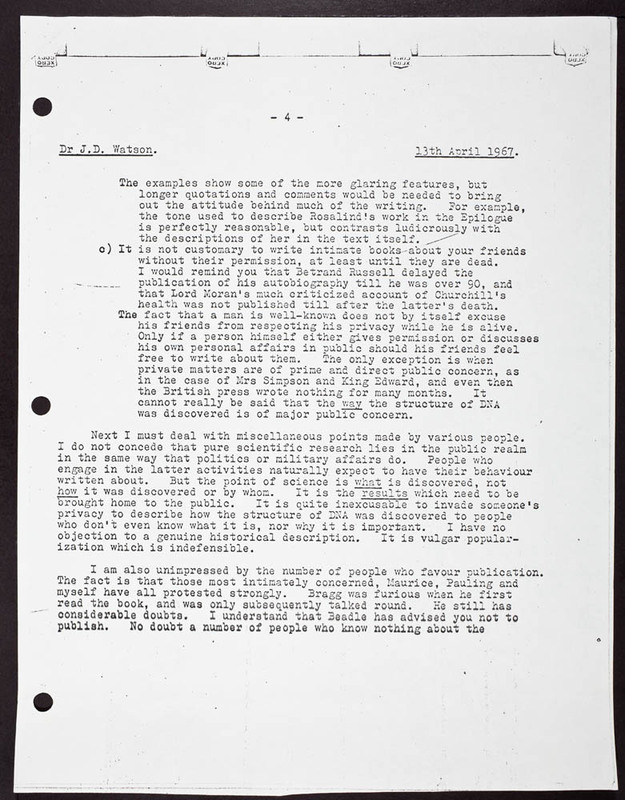 In 1949 he joined the Medical Research Council Unit, headed by M. F. Perutz, and began working in the Cavendish Laboratory at the University of Cambridge. He began collaborating with James D. Watson in 1951. Utilizing x-ray diffraction photographs taken by Rosalind Franklin, Raymond Gosling, and Maurice Wilkins, the two discovered the double helix structure of DNA in April 1953. 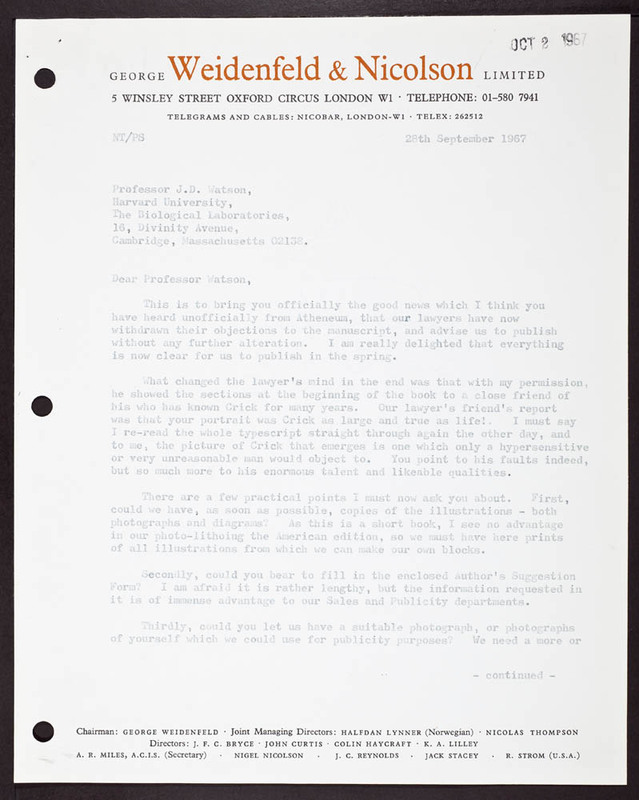 Francis Crick would send a series of letters to Watson in response to his manuscripts, including six pages of complaints in April 1967. 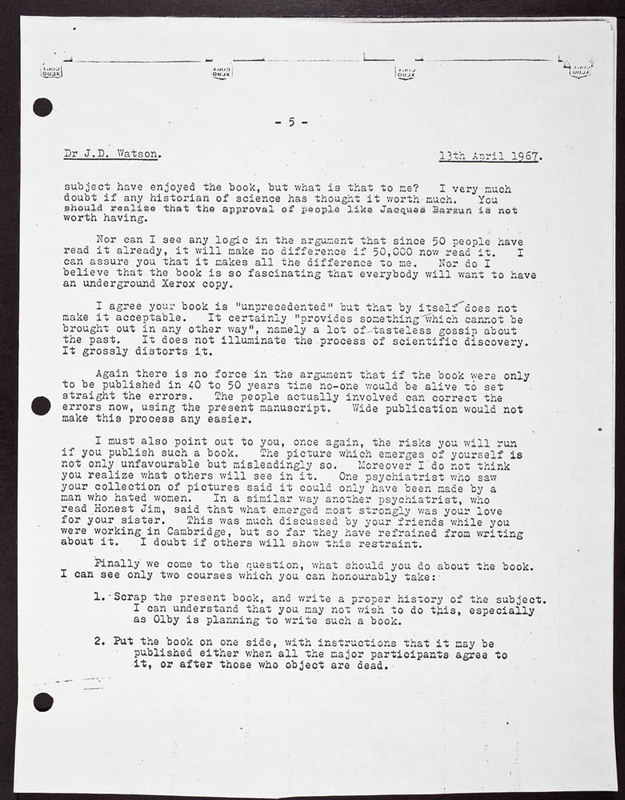 The letter concludes with: "My objection, in short, is to the widespread dissemination of a book which grossly invades my privacy, and I have yet to hear an argument which adequately excuses such a violation of friendship." Page: 01, 02, 03, 04, 05, 06. 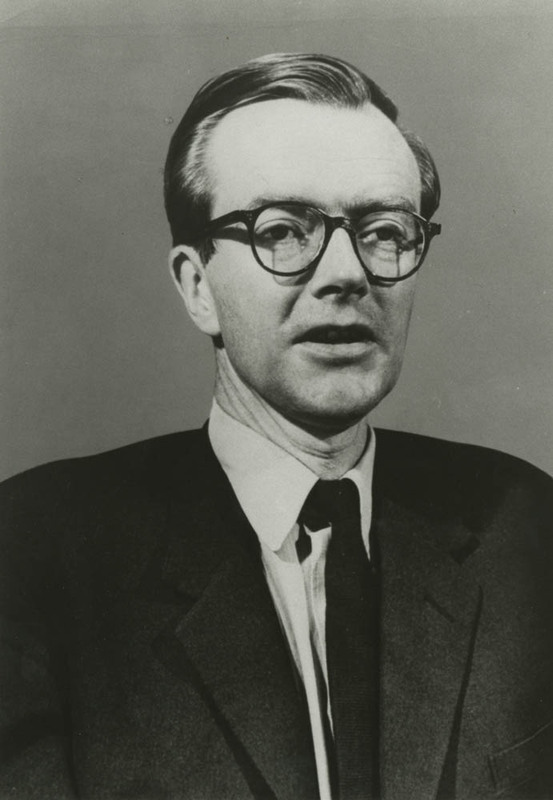 Maurice Wilkins was born at Pongaroa, New Zealand, on December 15th, 1916. He studied physics at St. John's College, Cambridge, taking his degree in 1938. He then went to Birmingham University where he studied physics and obtained his Ph.D. in 1940. 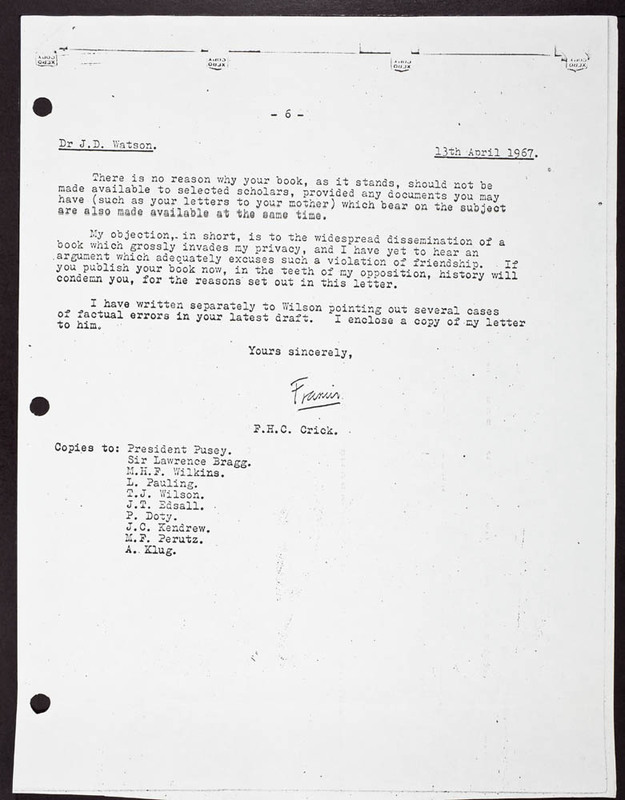 Like Crick, he worked for the British government on wartime problems, and was eventually assigned to the Manhattan Project in Berkeley, California. After the war he lectured at St. Andrews' University, Scotland, before moving to King's College, London, where he was a member of the staff of the newly formed Medical Research Council Biophysics Research Unit. 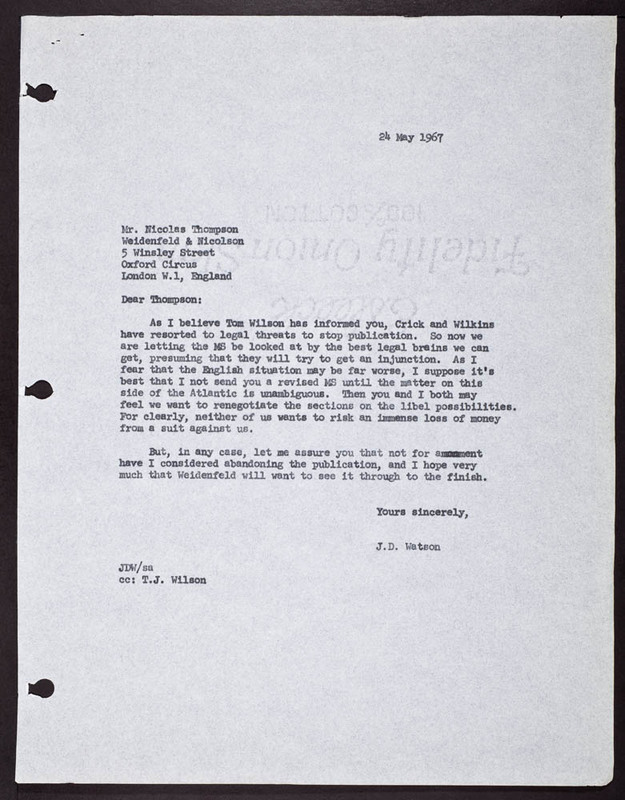 Wilkins, working with Rosalind Franklin, then began X-ray diffraction studies of DNA. The discovery of the well-defined patterns led to the deriving of the molecular structure of DNA. 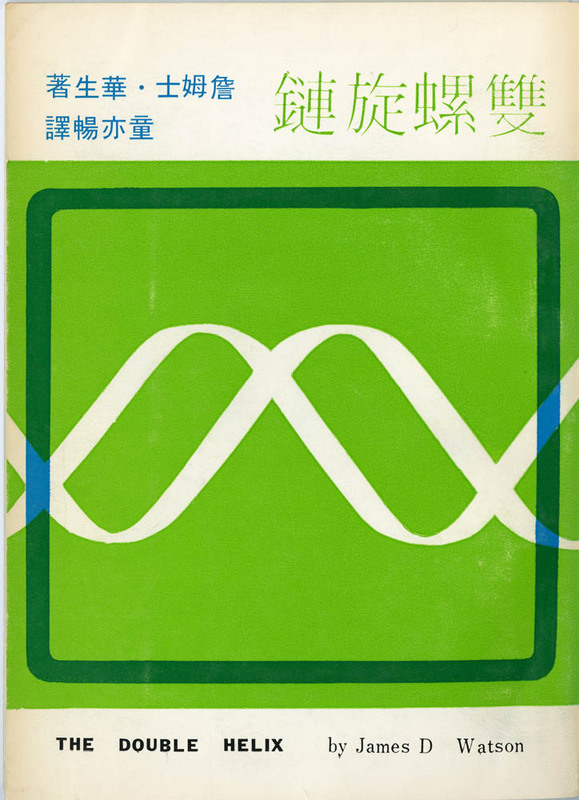 Further X-ray studies established the correctness of the Watson-Crick proposal for DNA structure. 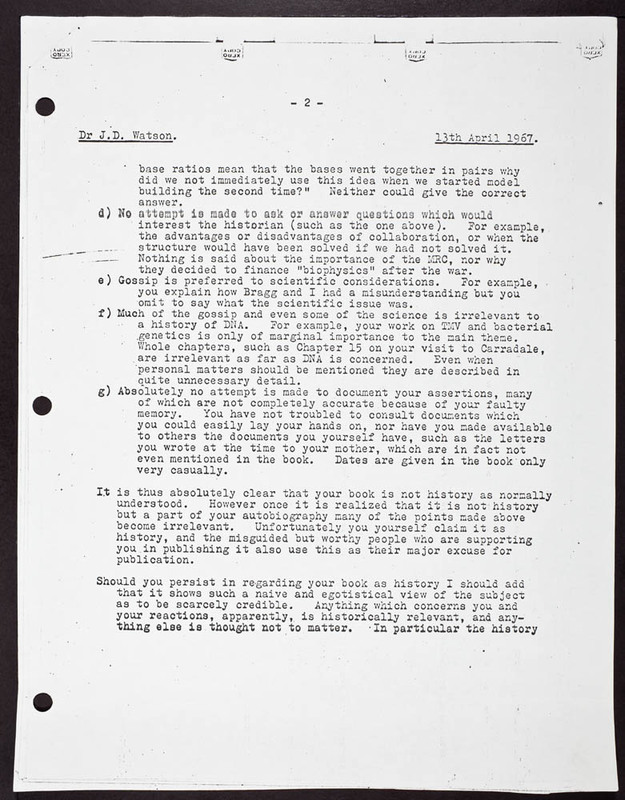 Both Crick and Wilkins threatened legal action against Watson. This made his American and British publishers uneasy and the fate of the memoir was uncertain. 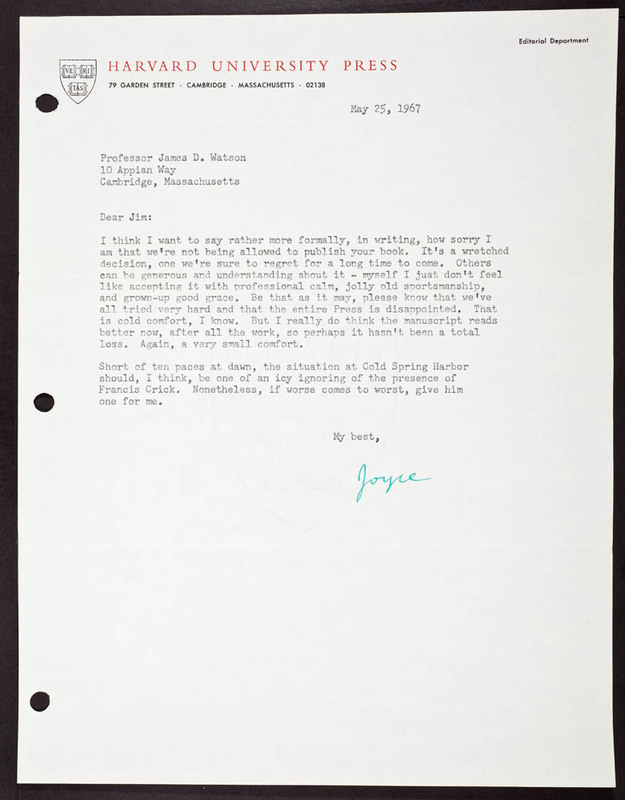 Joyce Lebowitz, an editor at Harvard University Press who worked on the manuscript, pushed the publisher to remain committed to the book. 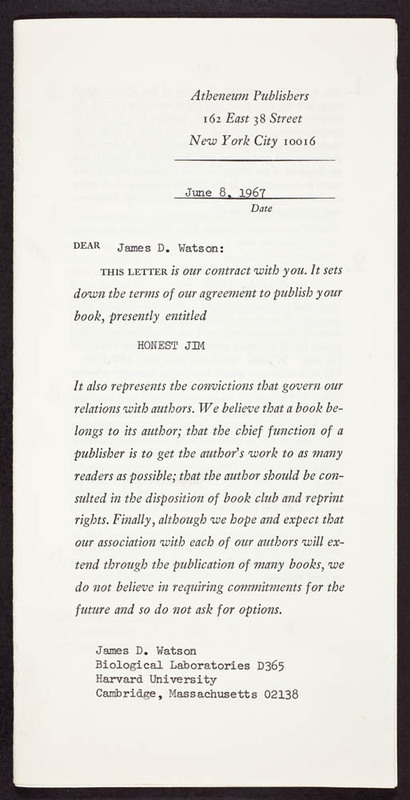 Due to fear of litigation, they would ultimately decide not to publish. In contrast to the Harvard University Press, Wiedenfeld & Nicolson decided that they would publish the book in the U.K. 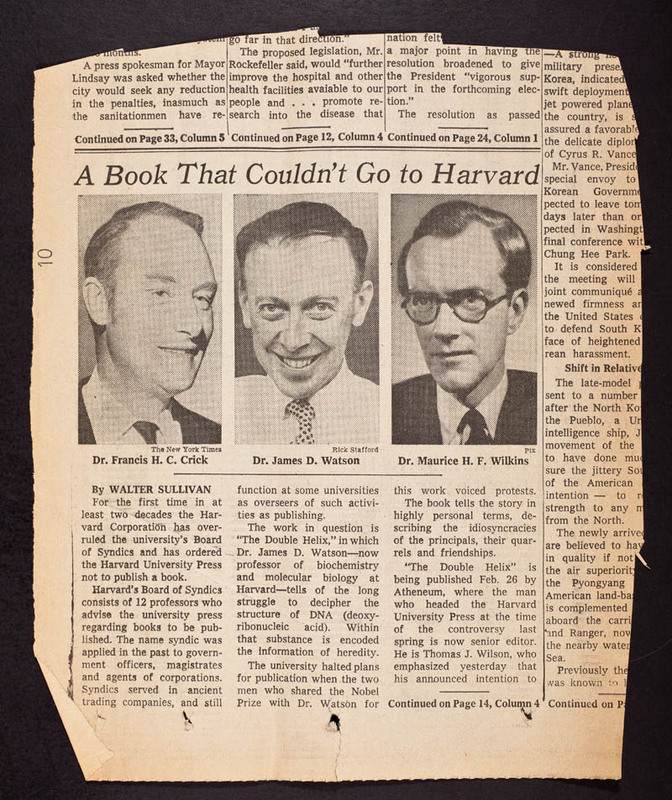 Soon after Harvard decided not to publish, Atheneum Publishers committed to releasing the book in the U.S. Both versions were released in 1968. 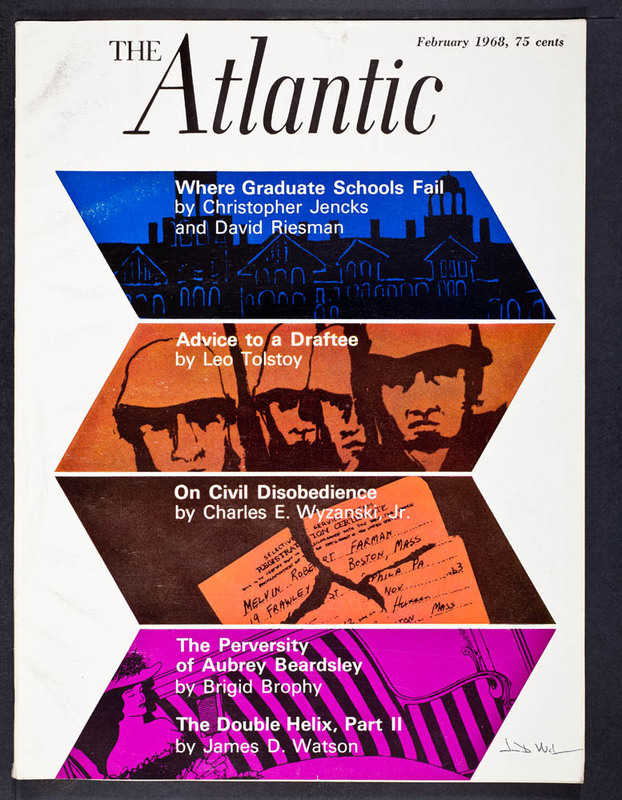 The public got its first taste of The Double Helix when it was serialized over two issues of The Atlantic in early 1968. 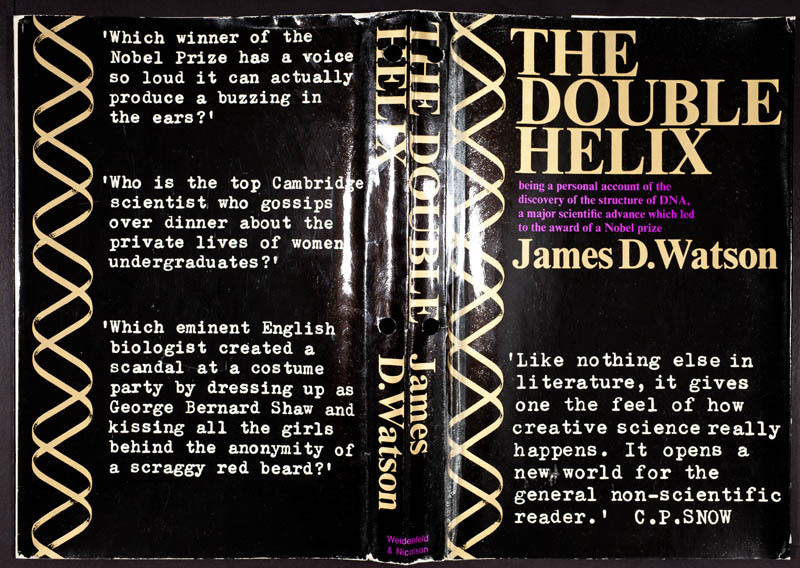 The British version of The Double Helix originally featured this book jacket, which capitalized on the book's controversy. Watson, who had not approved the jacket, was outraged and demanded the publisher retract them. 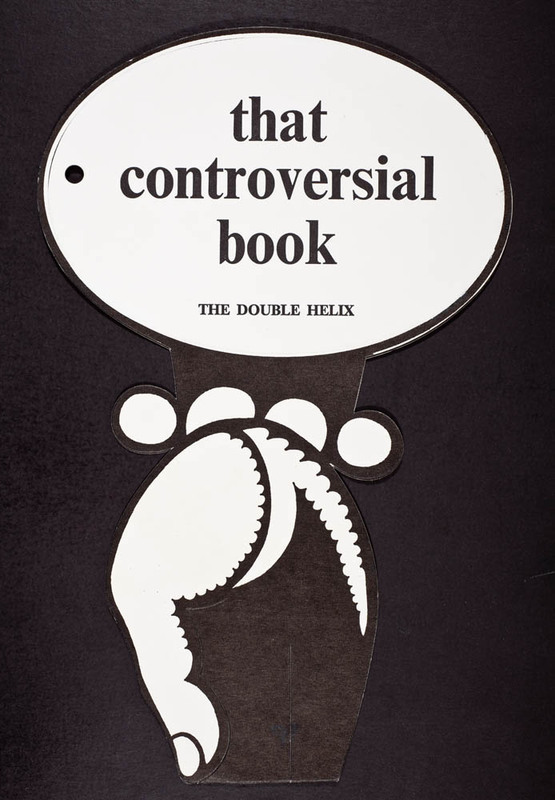 The book elicited strong responses, both positive and negative, at the time of its release. It remains controversial today and critics continue to revisit the book forty years after it was originally published. 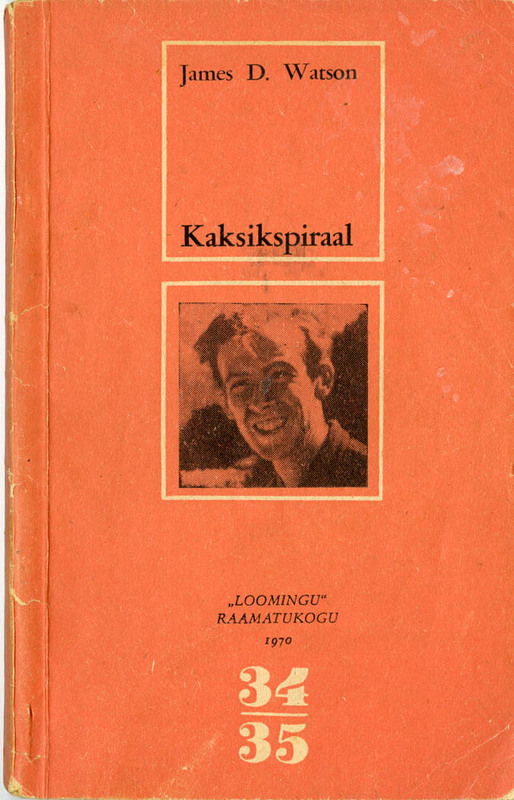 Since 1968 the book has been translated into many languages, including Bengali, Chinese, Czech, Danish, Estonian, Finnish, French, German, Hebrew, Hungarian, Italian, Japanese, Korean, Malaysian, Norwegian, Polish, Portuguese, Romanian, Russian, Spanish, Thai, Turkish, and Vietnamese. 40 years after it was originally released the book continues to be published world-wide. 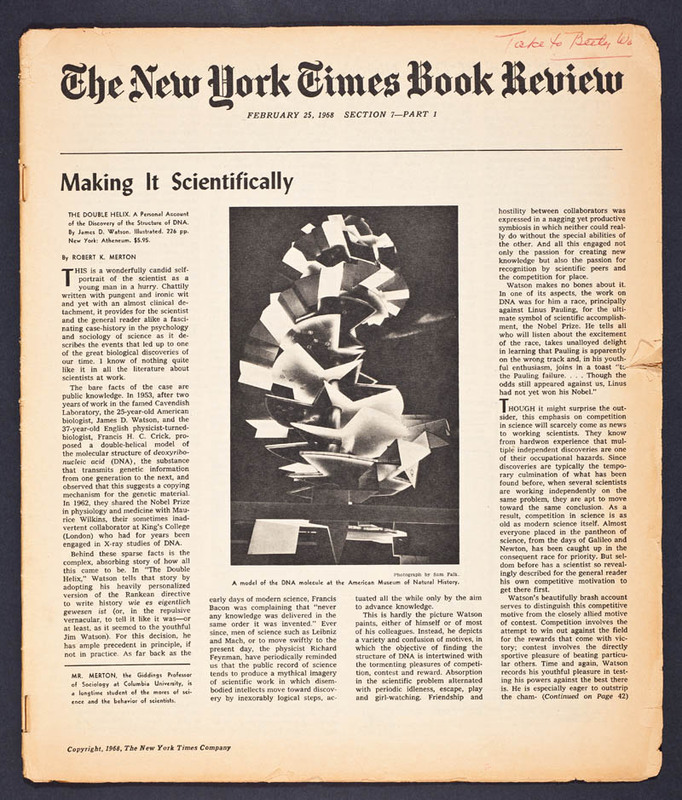 This exhibit uses primary documents to trace the story of the publication of The Double Helix-from its rejection from the Harvard University Press to the New York Times Best Seller List. Exhibit curated by John Zarrillo. All materials courtesy of The James D. Watson Collection at Cold Spring Harbor Laboratory Library & Archives. 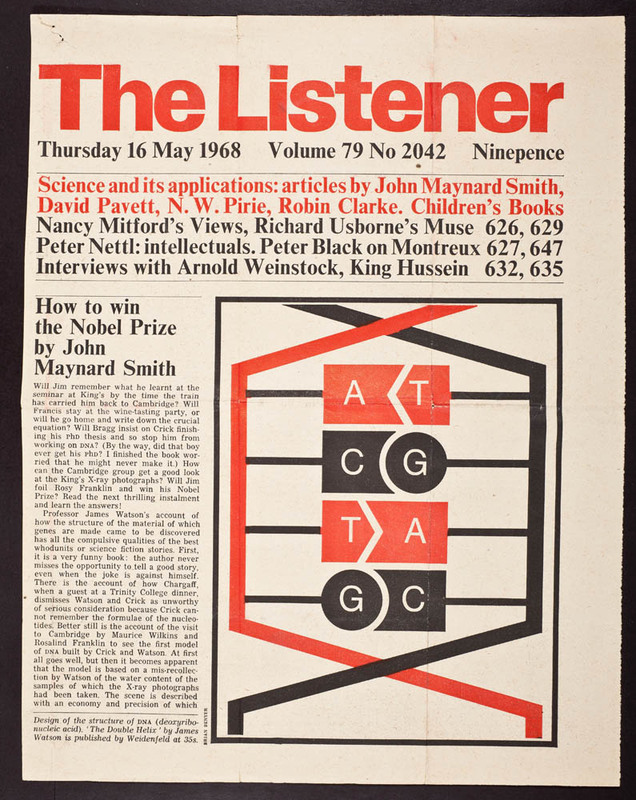 All materials digitized with funding provided by the Wellcome Trust as part of the 'Modern Genetics and Its Foundations' Digitization Project. 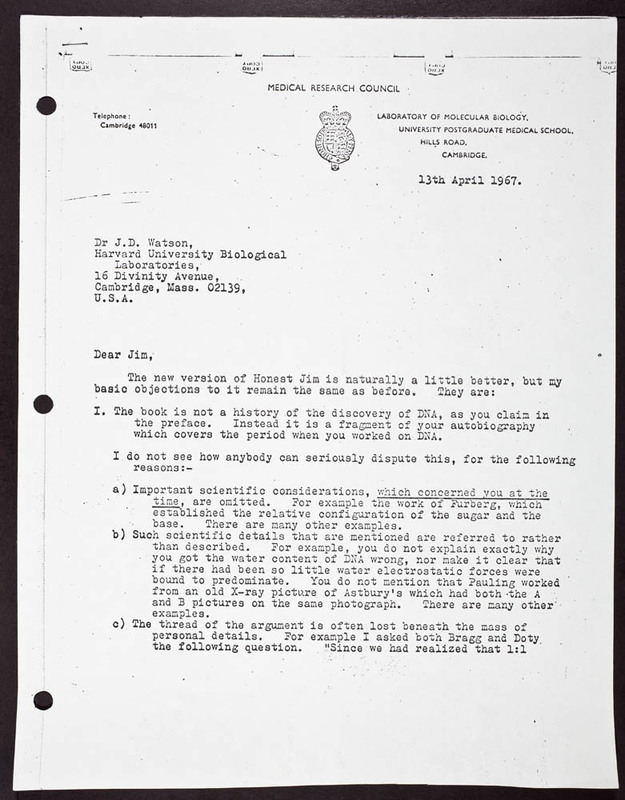 Copyright © 2012 Cold Spring Harbor Laboratory Archives. All Rights Reserved.